It’s Day 5 of 11 and as you pedal for Cortina d’Ampezzo, you are heading along what may just be the best cycleway in all of Italy. After breakfast you set off from Toblach, the 'gateway to the Dolomites'. You passed the serene Toblacher See and negotiated the tunnels, bridges and sweeping sections of cycleway through stunning alpine scenery. Idyllic picnic spots abound; a leisurely lunchtime by the side of the route proves a special treat. It’s hard to believe that just a few days ago you were at home, then flew into Venice Marco Polo Airport before being whisked to Bruneck. That was the the first night of your holiday among the mountains, pines and spruces of this delightful corner of Italy. You started falling in love with the area during the transfer. Then, after a good night’s sleep, delicious local hospitality and expert fitting of your chosen bike, you set off to explore Bruneck and the Puster valley. 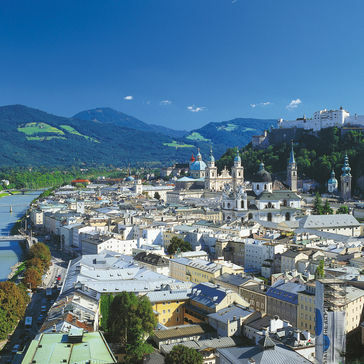 It was only your first day in the saddle but already you were falling for the area, for its rich architecture and history, and fascinating historical sites, including commanding Bruneck Castle. There was the fascinating local artisan cheese factory, the forest Stube where Mahler wrote his ninth (and final) symphony, and a short but rewarding ride up to the Toblacher See. Later, you explored the town’s pastel-painted Baroque parish church, and contemplated early twentieth-century history in the poignant setting of the sleepy, beautifully maintained, cemetery Di Guerra Sorgenti. All your workaday cares were left far behind. 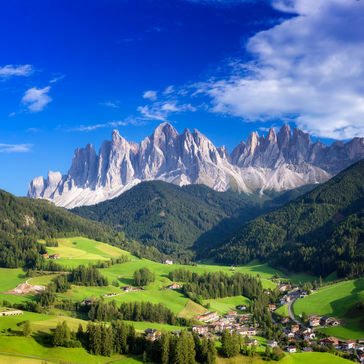 Now you are en route to Cortina, with wheels spinning smoothly along the well-maintained cycleway as it descends to the jet-set jewel of the Dolomites. After dinner, you plan to explore in the footsteps of James Bond 007 (the Roger Moore version in 1981’s For Your Eyes Only, which featured many scenes shot in Cortina. Tomorrow? Maybe an excursion into the alpine wonderland above the town to catch a breathtaking view of the world-renowned Tre Cime di Lavaredo. When it comes to alpine exploration, you may not be quite at the level of local mountain man, Reinhold Messner, but you’ll give it a go at your own pace. After a full day exploring Cortina, you’ll saddle up again to descend past the beautiful lakes and sun-dappled glades of the Ampezzo Valley. En route, you plan to picnic, before catching the train to Belluno at sleepy Calalzo di Cadore. After another great night’s sleep in the mountains, there’s more valley riding to look forward to. 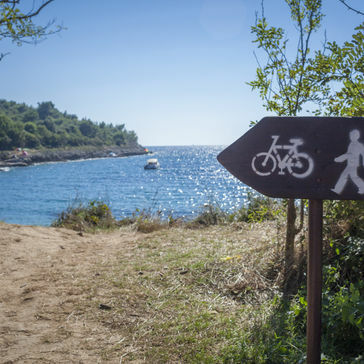 You’ll follow the course of the River Plave along easy forest trails linking villages that tempt with local gastronomy and the siren call of delicious local wines. You probably won’t resist as you break the day’s journey down to Feltre. It’s the place where Hitler famously met Mussolini not long before Italy’s surrender to the Allies in 1943. As well as exploring Asolo, you plan to hit the road again for the 13-mile ride to Bassano del Grappa, the home of fiery, world-famous grappa brandy. To use an Italian automotive analogy, think of Prosecco as a fast, refined, four-door Maserati Quattroporte. Grappa, however, is a stripped-down, race-ready, Ferrari 812 Superfast… . Naturally, you’ll sample both – you’re in Italy and all that… .And then there’s Bassano’s engaging history and architecture to enjoy too, including the wonderful wooden Bridge of the Alpini over the Brenta River. Prosecco, grappa, unique bridges and romantic old streets to explore; then the ride back to Asolo for a last night and another amazing supper. How can 11 days go so fast and be so richly packed with cultural, geographical, culinary and historical impressions? And so many amazing people? And such enduring, vivid memories?